Living here on Long Island can truly be a ton of fun, but if you're looking for something new and exciting to enjoy, you won't have to travel far! There's plenty of great fun in our neighboring states of New Jersey, Pennsylvania, Connecticut, and Massachusetts, as well as in Upstate New York! From skiing, tubing, and snowboarding, to amusement parks, and historical landmarks, to fine dining, casinos, shopping, and everything in between, your next big getaway could be just a short car drive away from Long Island! 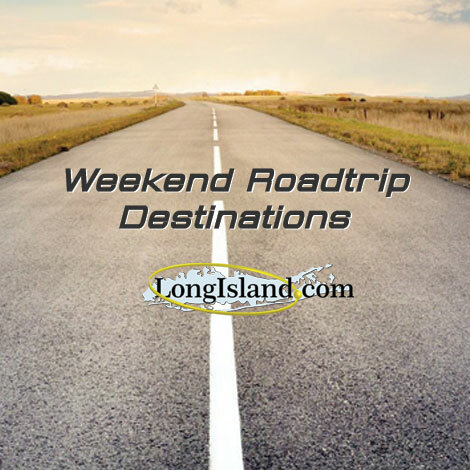 If you love Road Trips as much as you love living here on Long Island, then you're in luck - LI is close to fun no matter what you're interested in, and we're only a short car drive away from some of the East Coast's beloved destinations. Long Islanders are very lucky to neighbor the City That Never Sleeps. It truly doesn’t matter what your tastes are or how much time you have to spend, Manhattan has got you covered. Take the New York State Thruway north, and then keep going. A super simple morning drive will bring you to the nation’s largest park in the lower 48. The “forever wild,” six million acre forest preserve can be your home away from home. Even closer than the Adirondacks, the Catskill Park has so much to offer. Regional cuisine, outdoor sports, apple picking, antiquing and all variety of relaxation, the Catskills offer a majestic backdrop to your dream weekend getaway. The Finger Lakes region of Central New York is prized for its stunning glacier-carved scenery, as well as the unique microclimate that makes the local wine world renowned. Ever the perfect destination for a romantic retreat, Niagara Falls should be on every Long Islander’s bucket list. Visit the falls and turn your weekend getaway into an international adventure with a quick jump over the Canadian border. A few hours from Long Island, the Pocono region of Pennsylvania offers year-round seasonal fun and all classes of accommodation. The Poconos are a perfect destination whether you are on a tight budget, or you are really looking to treat yourselves and your loved ones to a luxurious getaway. A spoon full of sugar helps the history go down! Hershey-Harrisburg offers the perfect balance of entertainment and education. Check out Hershey Park and explore the local Pennsylvania Dutch Country. This weekend retreat is sure to offer memories to last a lifetime. Gettysburg is the perfect place to celebrate America. Whether you are looking to tour a Civil War battlefield, appreciate stunning architecture or spend time with your family enjoying some traditional American cuisine, this weekend getaway is sure to impress. Home of the beloved Sesame Place, Bucks County offers fun activities for the whole family, a happening nightlife, plenty of entertainment and a rich history. Known for its stunning beaches, boardwalk and casinos, Atlantic City has something to offer visitors of all ages. Getting there is easy by booking a ticket on a direct bus from Long Island. The name says it all. Explore Long Island from a new perspective, and while you’re there, check out the Mystic Seaport, the aquarium and historic sites. Save time by taking a ferry across the Sound. At the heart of New England, Boston has been a happening place for over 400 hundred years. This is the place to go if you want to combine the cutting edge of American culture while also appreciating our historic identity. Cut the drive in half by taking a ferry. A peninsula jutting out of the easternmost point of Massachusetts, Cape Cod is rich in maritime character and seasonal attractions. Do you have a favorite weekend road trip destination? Send us an email at tell us about it!